So a new season is upon us with 23 new and returning sci fi / fantasy shows that will be bowing between now and November (more on that at this link). That’s definitely a sign that the genre is alive and strong on television, but the fact is that the hefty quantity of shows certainly isn’t giving us any guarantees on quality. Sure, there are the few standouts among the active shows like The Walking Dead and Game of Thrones (which returns in April 2014), and there are several that provide decent enough distractions like Person of Interest, Arrow, and Supernatural and some of the newbies should be worth a look like Agents of S.H.I.E.L.D. and Dracula. But when it comes down to it, is it really worth investing the time to follow these shows or would I rather just go back and watch a classic series like Babylon 5 that I know will deliver a rewarding revisit? B5 is one of my all-time favorite TV shows. Sure, I rank classic Trek and The Twilight Zone (and perhaps The Prisoner) above it, but B5 was the one that I recall watching from start to finish when it originally aired and it delivered one of the most engaging and fulfilling television experiences that I can recall (even if Season 5 was a bit of a let down). I’ve seen every episode of the show at least once and most all of Seasons 1 through 4 two times. But it’s been years since I watched the show, and just like revisiting a great book series such as Dune or The Lord of the Rings, there’s a comforting pleasure to going back and re-experiencing a show like Babylon 5, especially considering the fact that it succeeded at telling the full story it originally planned to tell. Sure, B5 could be cheesy at time (the CGI sfx weren’t quite at today’s level of sophistication), and the acting could be stilted, and some episodes were just plain bad. But when it ws hitting on all cylinders–which was more often than not–that series delivered some of the best science fiction television ever (I don’t care what Sheldon says), especially from Season 2 through Season 4. And it stands up to–even demands–multiple viewings that allow you to appreciate the intricate details of the story J. Michael Straczynski unfolded over its five year run (he actually had a plan that he followed for the most part, Lost and BSG writers). Of course, watching a series over and over is something I have always enjoyed which makes sense seeing as I grew up during the golden age of UHF reruns, the 1970’s. During that decade I watched each episode of Star Trek umpteen times (I used to be able to tell you the episode title within 30 seconds of the opening teaser scene) as well as The Twilight Zone, The Outer Limits, Lost in Space, Jonny Quest, Ultraman (and, well, Gilligan’s Island). Call these classic shows the comfort food of television and there are plenty more to add to the list from the past thirty or forty years. And Babylon 5 is not the only sci fi show I currently have a hankering to revisit. I’d love to go back and re-watch all four seasons of Farscape. It would be great to watch Lost from start to finish and see if there really are signs that there was any sort over-arching plan driving that show (even if not, it delivered some first-rate drama). The Battlestar Galactica reboot is another one I would like to re-watch (I’ll just skip the finale, though, and come up with my own). And it would be great fun to go back and do a marathon of the mythology episodes of The X-Files (through Season 6 at least). Then there’s shows that I never got around to finishing like Buffy the Vampire Slayer and Angel. And I all but gave up on Star Trek: DS9 by its third season, so it would probably be worth checking out Seasons 4 through 7 which everybody tells me were the best years of those shows. And the fact is, that I can pretty much watch all of those shows mentioned at no additional cost because they are part of the Netflix and Amazon Prime subscriptions I already have (and I actually have quite a number of them on DVD as well). So there’s plenty of enjoyable hours of great sci fi / fantasy viewing right at my fingertips, all of which are worth the investment of time. These are great shows which stand up to multiple viewings, and it’s currently on my to do list to get to all of these and more at some point in the (hopefully) near future. So that said, is it worth spending the time to check out these 23 sci fi / fantasy shows airing this Fall (with more coming at mid-season)? I’ll definitely give most of the new ones a look, and I have several returning shows on my watch list. But the first episode of Sleepy Hollow didn’t excite me too much and The Originals (the pilot is available for early viewing on Hulu Plus) will at best be a guilty pleasure. And there’s plenty of hours of my life from the last few years I would like to get back from watching mediocre to just plan bad shows like Revolution, Falling Skies, Terra Nova, The Event, V, and more. The time I invested (nay, wasted) watching those would have gotten me a couple of seasons in to Babylon 5 or further. How many hours will I fritter away this season watching lame sci fi when I could be rediscovering classics that are worth spending my time on? But the fact is that I will be tuning in for several of the new and returning Fall shows because you never know when the next classic might sneak on to the tube. However, my threshold for sticking with a show drops each season. It took me half a season before I kicked Revolution to the curb last year (and even then I went back and checked in on it later in the season). This year, if a series isn’t showing promise by its third or fourth episode, I’m likely out (I’ll might keep an eye on the social networking sites to see if people claim it has improved, though). Whether I stick with a show or not beyond that point will be based on this simple criteria: would I rather be watching Babylon 5? Like you I am also a fan Babylon 5, the thing is I miss are shows that are set in space and all the fantasy shows do not exactly thrill me. I bailed on Revolution after one episode and Terra Nova at 3 episodes. Falling Skies I stuck with mainly due to that fact there was noting else on that night in the summer, but the writing is so lame I doubt I will bother next summer. By the way, I am one of the people that liked the last episode of BSG. I was certainly better that the last of Lost. 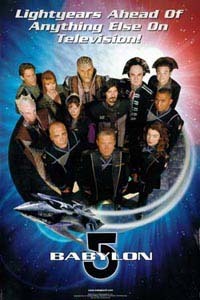 I’m re-watching B5 right now I miss scfi shows with a good story and actors playing characters you get to know.The last series I really liked was Enterprise but sadly all the new shows have lost that soap opera style scfi I loved.I also loved Farscape with equally with all it unique ideas!